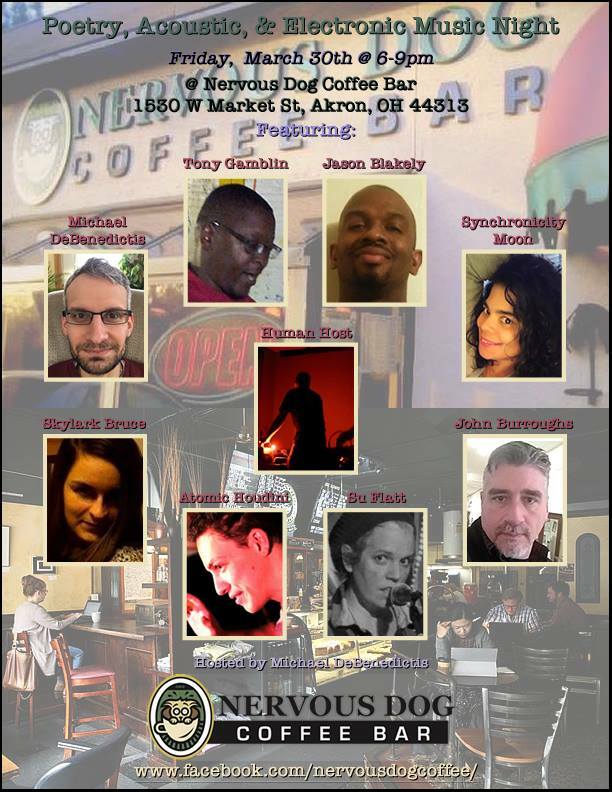 Serving was the 2016 Yellow Chair Review Chapbook Contest runner up. It is perfect bound, 6x9", and features 18 poems on 28 pages. Cover design by Kari Gunter-Seymour. ISBN: 978-1-940996-48-6. 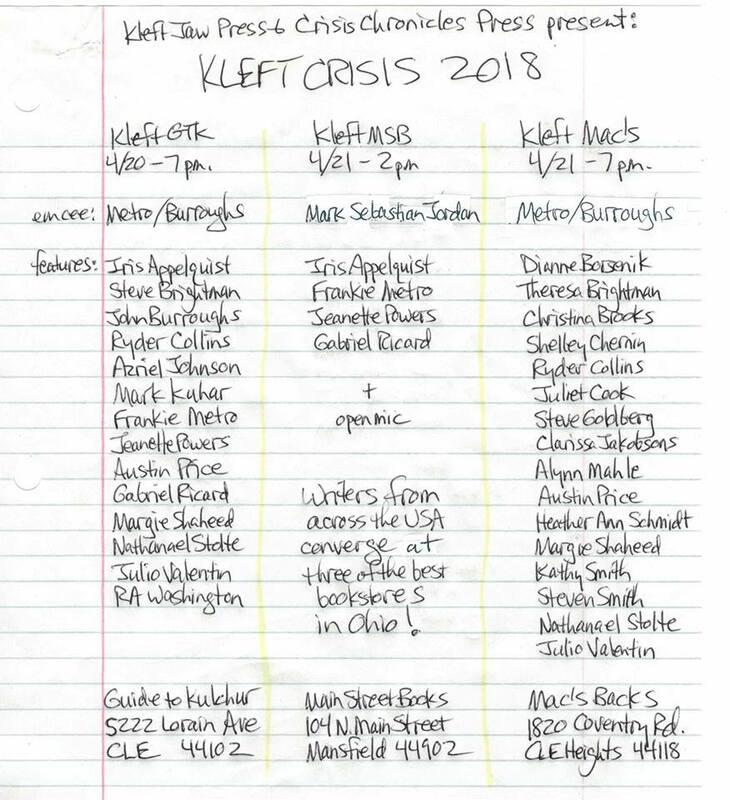 Available for $7 from Crisis Chronicles Press, 3431 George Avenue, Parma, Ohio 44134. Twice a Pushcart Prize nominee, Kari Gunter-Seymour blames her method of writing on the rich Appalachian Ohio soil, her wildly eclectic family, her neighbors and the wars in Iraq and Afghanistan. She holds a B.F.A. in graphic design and an M.A. in commercial photography and is an instructor in the School of Journalism at Ohio University. She is the Poet Laureate for Athens, Ohio. 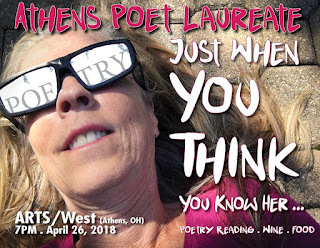 Her poems can be found in numerous literary journals, Rattle, Crab Orchard Review, The American Journal of Poetry, The Los Angeles Times and on her website at www.karigunterseymourpoet.com. Okay, here's the tentative schedule of features for #KleftCrisis2018, hosted on 4/20 and 4/21 by Kleft Jaw Press and Crisis Chronicles Press with writers from across the country at three of the best bookstores in Ohio: Guide To Kulchur Books (Cleveland), Main Street Books (Mansfield) and Mac's Backs-Books On Coventry (Cleveland Heights). Alan Kleiman, a.k.a. 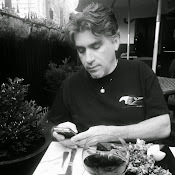 Ace Mulvahil was interviewed last night on the on JohnMac's BlogTalk radio show. You can listen here! 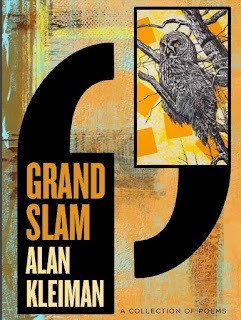 Alan is the author of Grand Slam, a collection of poems that Crisis Chronicles Press had the honor of publishing a few years back.